Data Connect 5204A-GRD is an economical 4-port ADSL2+ Firewall Router Device with 802.11g Wireless AP ideally designed for home and SOHO users to enjoy rich firewall security, mobility, and faster speed when using ADSL Internet connection. With integrated Wireless 802.11g AP, the router enables you to surf the internet anywhere in your home. The router lets you share high-speed ADSL Internet connection, even faster with advanced ADSL2+ capability of downstream rate up to 24Mbps. The powerful SOHO Firewall feature protects against hackers’ attacks when you surf the Internet. VPN pass-through is also built-in for secure access. In addition, the web-based Graphic User Interface allows you to install and manage your network easily. 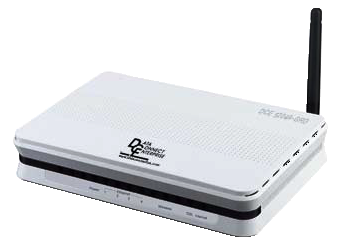 The Data Connect 5204A-GRD makes fast wireless net surfing affordable and easy – Going online is just ‘plug & play’. -Prevent DoS attack including Land Attack, Ping of Death, etc.